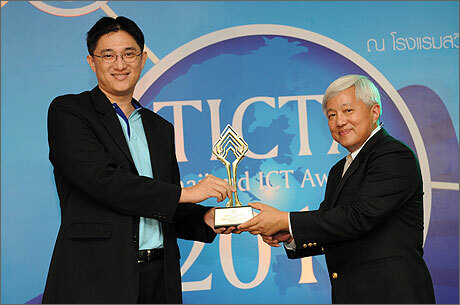 Among all winners this year, ThaiQuest Limited, Thailand’s leading information management and search technology solution provider swept two awards in “Thailand ICT Awards 2010 (TICTA 2010)” in two categories: “iQNewsClip” for e-Government and Services category and “ThaiQuest e-Edition” for Research and Development category. These two software will soon accompany other category winners to represent Thailand in the regional contest called “Asia Pacific ICT Alliance Awards 2010 (APICTA 2010)” to be held in Malaysia this October. TICTA is a national software competition organized under the co-operation of the Ministry of Information and Communication Technology (MICT), Software Industry Promotion Agency (SIPA) and The Association of Thai ICT Industry (ATCI). Its goal is to encourage Thai software companies to continuously enhance their product quality, prepare for a successful software promotion strategy as well as to emphasize on improving knowledge in innovation and technology. TICTA 2010 winners were officially announced on August 23, 2010 at Swissotel Le Concorde with an honor of Santi Surarat, Vice President of SIPA, as the president of the ceremony. Sixteen software were selected winners out of 17 categories from over 124 software nominees around the nation. 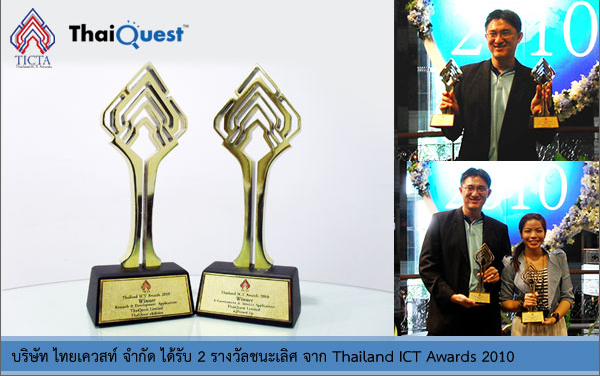 This year, ThaiQuest Limited claim two first prizes from two software categories. In e-Government and Services, “iQnewsClip” features efficiently solve time-consuming process for both public sectors and other large organizations in cropping newspaper article on the daily basis. Its Full-text Search feature enables fast and precise search for any word or phrase from any newspaper source via online network. Each news clip is presented in a clean and clear format with optional viewing styles: black and white, color and text only. “ThaiQuest e-Edition” from Research and Development, on the other hand, provides a surreal newspaper reading experience via web browser supporting Touch-screen, Full-text search technology, Page Flip, Zoom-In/Out, and Magnifier that preserves the crystal clear resolution of article text and images. The software is scheduled for commercialization in the near future. Sarana Tasanasant, Senior Manager in Business Development of ThaiQuest Limited, noted “ThaiQuest’s target is to offer software development as a service. Our strength lies in the seamless combination between our massive databases, expertise in software development whose distinctiveness is incorporated of in-house search innovation and add-on technology improvement. As a result, our software implementation directly and effectively cuts back our customer’s investment. “We are honored to win two awards in this competition. It is, indeed, a great inspiration for us to gear toward a higher standard software development and service quality and to represent Thailand in Asia-Pacific regional contest or known as APICTA 2010 which will be held in Kuala Lumpur, Malaysia during October 12-16, 2010,” he continues. ThaiQuest Limited is a Thai company with its business focus on software and technology development that is capable of tackling massive amount of data in the shortest time possible. Over the decade, its software specialists carefully conduct numerous research, design and develop a genuinely fast and reliable search engine (ThaiQuest Enterprise Search) that outshines other search engines available in the market as it supports real-time, full-text search in Thai and English, unlimited data storage and sub-second retrieval. ThaiQuest achieves Capability Maturity Model Integration (CMMI) from Software Engineering Institute (SEI) in March 2008.